Importance. -- This borer attacks red and white oaks throughout the East. Trees weakened by drought, defoliation, or other factors are most susceptible. 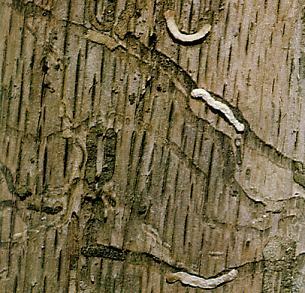 Larvae destroy the cambium and girdle the tree. Mortality can be extensive in weakened stands. Identifying the Insect. -- Adult beetles are about .2 to .5 inch (6 to 12 mm) long, slender, and black with a light yellowish stripe on each wing cover. Larvae are white, slender, flattened, about 1 inch (25 mm) long, and have two spines at the rear end. Identifying the Injury (figure 23). -- Larvae excavate winding mines in the inner bark and outer sapwood of the main trunk and large branches, frequently girdling the tree. Attacks usually begin in the tree tops and extend downward as the trees continue to weaken. D-shaped emergence holes are evidence of infestation. Biology. -- Adults emerge during spring and early summer and deposit eggs in bark crevices. Eggs hatch in 10 to 14 days and the larvae burrow through the bark and cambium. They overwinter in cells in the bark and pupate the following spring. There is one generation per year. Control. -- Control is mainly a matter of preventing attacks through cultural practices that promote tree vigor. Spraying to protect foliage from defoliators is recommended in some areas. Trunk sprays offer some promise. Figure 23. -- Twolined chestnut borer larvae and galleries in inner bark.